Facts and history about the life and lifestyles of Native American Indians. A Pow-wow is a term that is commonly used to describe a gathering or meeting. The word originated from Native American Indians when they attended important ceremonies, tribal dances, feasts and sacred rituals. The Pow-wows were organised by Medicine Men and the spiritual leaders of the tribes. As Native Americans began to associate with Non-Indians, important meetings, or Pow-wows, were organised to negotiate the terms of peace treaties. As many as 5000 Native Americans were known to attend such occasions and Pow-wows required meticulous planning and organisation just as they do in the present-day. 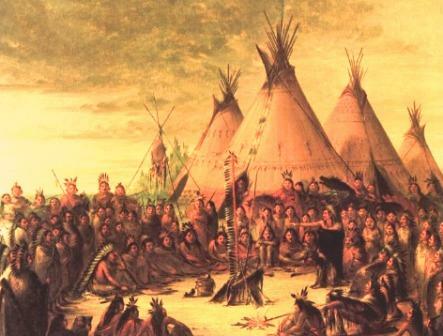 The picture, by George Catlin, was sketched in 1832 and depicts a grand feast organised by the Sioux tribe and attended by the artist himself and Major Sanford, the Indian agent. 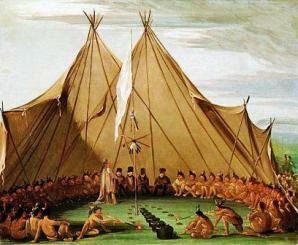 The picture provides and indication of the size of the tepees that were erected for this occasion. The Pow-wow included a great feast, rituals and religious ceremonies accompanied by music and dancing. The purpose of the event was to act as a testimony to the sacredness of the vows of friendship that were made by both parties.